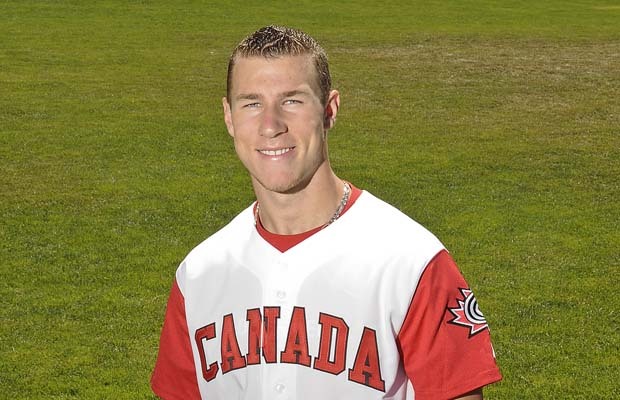 Rob Bland (Intern- MLB Reports): The Brett Lawrie rollercoaster started December 6th, 2010. Lawrie was sent to Toronto in exchange for Toronto’s incumbent ace, Shaun Marcum. Toronto GM Alex Anthopoulos immediately said that Lawrie would be working out at third base, switching from second base. This would be Lawrie’s third major position change in 3 years. He was drafted out of Langley, BC by the Milwaukee Brewers in the 1st round (16th overall) of the 2008 MLB draft. That year, Toronto held the 17th pick, and it was said that they coveted him greatly. They instead had to settle for college first baseman and current AAA prospect, David Cooper. Lawrie hit .293 in spring training this year, while playing decent enough third base to warrant a discussion of keeping him on the roster. However, Anthopoulos deemed he was not ready to play in the Major Leagues, and the fans in Toronto grumbled as the Blue Jays consistently put Edwin Encarnacion at third base to start the year. Lawrie started off hot in AAA Las Vegas, and played good defense. This still wasn’t enough, as the Jays asked him to be more patient and change his approach. 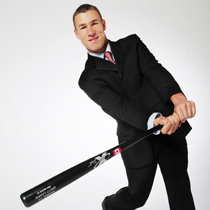 Lawrie did just that, and by May 31st, was hitting over .350 with power and walking more often than he had in the past. When the Jays were on the brink of calling him up (see our Report from June 2nd), Lawrie was hit by an errant pitch on the back of his left hand. Blue Jays fans collectively held their breath, and Lawrie declared it was a bruise. Two days later when swelling subsided, it was found out that Lawrie had a non-displaced fracture. When he finally returned to Las Vegas in the middle of July, Lawrie came right back to where he left off. He is now hitting .352 with 18 home runs and 61 RBI. More importantly, he has 26 walks and is playing much improved defense. Now, the Jays’ faithful are continuing to call for him. Anthopoulos and manager John Farrell have repeatedly said “he’s close” and that they want to get him everyday at bats before rosters expand in September. Now, when Lawrie gets the inevitable call (my guess being Friday, August 5th, before the beginning of a road series in Baltimore), where will he play? The Jays have Jose Bautista, one of the top three players in baseball at third base. Well, the plan that Anthopoulos has set out is that Bautista would shift back to his preferred right field, creating a logjam of young and talented outfielders. Travis Snider is 23 years old and he will play every day at one of the corner positions. Colby Rasmus is 24 years old and will be in center for the foreseeable future. That leaves Eric Thames, also 24, the corner outfielder who came out of seemingly nowhere to win the love and admiration of many fans, on the bench. You could say that Thames can just DH because he isn’t the best fielder of the bunch (although more than adequate and constantly improving), but where does Edwin Encarnacion play then? Encarnacion is one of the hottest hitters in all of baseball since the beginning of July. He has 9 doubles, 4 home runs, and 14 RBI with 12 walks in 25 games over that span. Thames most likely gets optioned to AAA to get every day at bats until rosters expand in September. Here is how that lineup stacks up. If one of these players is traded, then there won’t be a problem. The only other option barring a trade, is something that Anthopoulos has stated adamantly will not happen. Moving Lawrie to second base and sitting former Silver Slugger Aaron Hill on the bench. This could possibly be the best option available for both the short-term and long-term. With Hill underperforming (ranked 20th out of 21 qualified 2nd baseman in WAR), and his $8M option for 2012 likely to be declined, Lawrie could slot into that spot for a very long time. Anthopoulos has preached having talent and skill “in the middle of the diamond” and second base is a spot that sorely needs some stability after Hill’s last two years. The only thing that could stop this movement is if Anthopoulos sees Hill, who is a good defender, as a guy who can turn his career back around. If Hill were placed in the 9 hole, and changed his approach, he could be a very serviceable player there. One idea that has been bandied around is that the Jays decline the option on Hill, and sign him to a much smaller deal to bring him back as the second baseman. I honestly believe that Anthopoulos has the wheels turning, and with Encarnacion being so hot, many teams would love to take him on to make a push for the playoffs. If Encarnacion is not in the picture, there is a spot for Thames as a full-time player. He and Snider would probably split time between left field and DH, with Bautista in right, and Lawrie at third. What gets lost in all of this, is that the Opening Day center fielder, might become a 5th outfielder. Rajai Davis has 33 stolen bases, and is playing better in a part-time role since Rasmus joined the team. He will be reserved to being a pinch runner, and possibly a late inning defensive replacement for Thames. The odd man out for this year seems to be Thames, even though the Blue Jays see him as a valuable asset for the long-term. Whether that means for him to be on the field, or using him as a trade chip remains to be seen. Lawrie will likely end up playing third base every day, proving why the Jays gave up Marcum for an unproven “troubled” prospect.